When our brain is in “focus” mode, our brain uses the regions what is called the task-positive network (TPN). When our brain is not focused on the outside world and the brain is at a wakeful rest, the brain uses the regions what is called default mode network (DMN). Normally, the DMN and TPN are anticorrelated—when one is up, the other is down. The DNM is active when one is engage in internal tasks such as daydreaming, envisioning the future, retrieving memories, and thinking others’ perspectives.The DNM releases unresolved tensions in our lives. The default mode network is more active for creative people. During wakeful rest, the brain consolidates recently accumulated data, memorizing the most salient information, and essentially rehearses recently learned skills, and finally etching them into the brain’s tissue. Normally, default mode of humans appears to be that of mind-wandering. In my earlier article I have discussed about the effect of meditation on brain structure. In this article I discussed the effect of meditation on default mode network. Understanding how meditation and DMN work together is central for understanding for deeper levels of meditation. Here we present a basic model of DMN and its role in meditation. Default mode network are a multilayer, hierarchical network of neurons not some isolated regions of the brain. 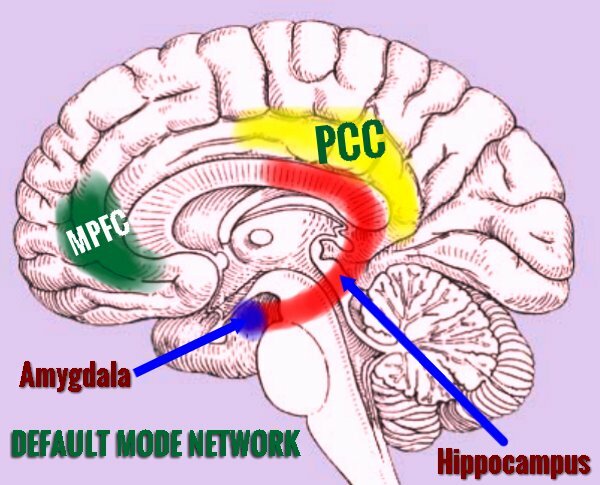 However, medial prefrontal cortex (MPFC) and the posterior cingulate cortex (PCC) are key regions of default mode network. The DMN network have a strong connections to the hippocampus, which records and recalls autobiographical memories. The DMN network is deeply connected with amygdala associated with fear and fear conditioning. Conditions such as anxiety, autism, depression, stress disorder are linked to amygdala. It is observed that main areas of the default-mode network (medial prefrontal and posterior cingulate cortices) are deactivated in experienced meditators across all meditation types. There are two types of meditation: Nondirective meditation and directive meditation. Nondirective meditation techniques are practiced with a relaxed focus of attention that permits spontaneously occurring thoughts, images, sensations, memories, and emotions to emerge and pass freely, without any expectation that mind wandering should abate. These techniques are thought to facilitate mental processing of emotional experiences, thereby contributing to wellness and stress management. Mindfulness meditation is a nondirective type of meditation. Directive meditation or concentrative practicing was characterized by higher activity in the right medial temporal lobe (parahippocampal gyrus and amygdala). However, deactivation of key regions of the DMN may contribute to the experience of mindfulness meditation. Mindfulness meditation is very easy. Just sit down comfortably and count your breath up to 100. While counting, you may lose track, your mind may wander. Don’t worry, again start counting from one and repeat the process. Do this for about 20 minutes. The goal of mindfulness meditation is to clear the mind of wandering, stream-of-consciousness thoughts by focusing attention on posture and breathing. We observed that different styles of meditation have different neural mechanism. Each meditation technique have different effect at neuron level, nerve level, circuit level and region level. Moreover, neurotransmitters and hormones play vital roles in meditation. However, at a very high level, at region level, we can say, meditation is a dynamic interplay between the prefrontal cortex (PFC), DMN, amygdala and insular cortex. Mindfulness meditation enhances connectivity between DMN and task-positive regions. Mindfulness meditation reduces the size of the amygdala. It is also observed that after eight weeks of meditation, the connection between the amygdala and the rest of the brain gets weaker, while the connections between areas associated with attention and concentration get stronger. Finally, we observed that brain activity patterns in all types of good meditation is primarily in the prefrontal cortex and in the insular cortex. These two areas are also crucially for meditation-related neuroplasticity. This entry was posted in Articles, Brain Functions, Brain Research, Meditation, Meditation Research, Mindfulness Meditation and tagged amygdala, Default mode network, insular cortex, meditation and the default mode network, task-positive network. Bookmark the permalink.